Buying a home is an incredibly exciting experience. As a matter of fact, many people will describe it as a bit of a whirlwind. Once you’ve spoken to one of our Scottsdale mortgage brokers and gotten the ball rolling the truth is that it gains speed pretty quickly. When your budget is set, you can start looking for homes, put in an offer, and then go through the closing process. While you’re going through inspections and the like, it’s also important to keep a few things in mind. Being a new homeowner means that you’re doing a juggling act and it can be all too easy to forget about some of the finer details. Not to worry though, because the team at Scout Mortgage is here to lend a helping hand! In today’s post we’ll share a few things that we think new homeowners should keep in mind. Keep reading to learn more! Are You a New Homeowner? Keep These Things in Mind. Whether you just purchased a new build or you have fallen in love with an older home for its unique charm there will inevitably be things that come up that you’ll need to take care of. Ah, the joys of being a homeowner! The truth is that owning your own home really is one of life’s biggest pleasures, but it also means that if something needs to be fixed, it’s your responsibility. Start setting aside money now so that when something comes up in the future it won’t be a setback. You’ll no doubt want to make some changes around your home. For some, it might mean doing a total landscape renovation in the backyard complete with a new deck. For others it could be finishing the basement. Some may plan for smaller projects such as new fixtures throughout the home. No matter what your plan is, make a list in order of priority to help keep yourself on track. Checking things off of your to do list is incredibly satisfying and your home gets better in the process! As a new homeowner, you’re no doubt feeling like every little thing you have planned needs to get accomplished sooner than later. Here’s the truth–you just made a big decision, so give yourself some room to breathe! Enjoy the process of settling into your home rather than feeling like you have to get it all done right this minute. 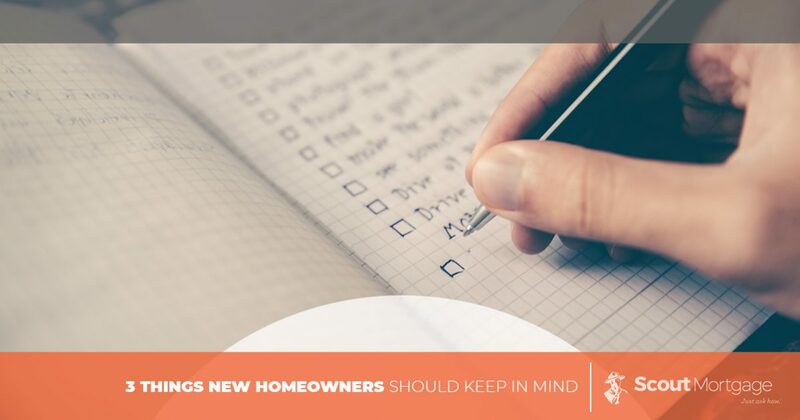 There’s plenty of time to tackle all of the tasks you have on your plate, so slow down and have fun being a new homeowner. Starting Your Search? We Can Help! Are you planning to purchase a home in the near future? If so, our Scottsdale mortgage brokers are here to help! We’d love nothing more than to offer you the best mortgage services in the area. Getting prequalified is an important first step in the process, so before you start your home search, turn to the team at Scout Mortgage.